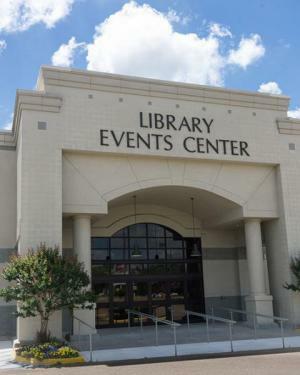 The Lincoln Parish Library Events Center space is available to the public for rental for various events. It contains multiple rooms and there is flexibility as to the arrangement of the space and furniture in these rooms. There are two catering prep areas. Each are equipped with commercial refrigerators, ice makers, and commercial sink, as well as various counters and multiple receptacles for warming stations. Reservation Request Forms must be submitted to library staff at least 30 business days before the event. Check out the Lincoln Parish Library Events Center policy for more detailed information or call 318-533-5509. -Dubach Room: (option 1 of the auditorium breakdown) platform and a drop-down projection screen with an in-ceiling projector. -Choudrant Room: (option 2 of the auditorium breakdown) drop-down projection screen with a portable projector available. -Simsboro Room: (option 3 of the auditorium breakdown) drop-down projection screen with a portable projector available. -Grambling Room: 2,335 square feet, can accommodate 235 guests in a standing reception, or 200 seated in theater style. -Ruston Room: 6,765 square feet, can hold 675 in a reception style setting, 615 theater style, 340 in classroom style, and 500 in a banquet seating.